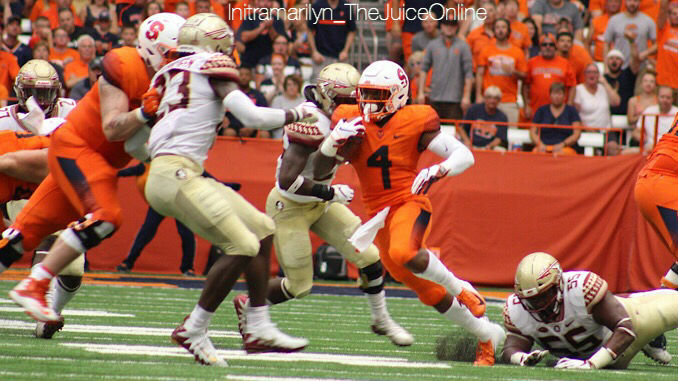 Dontae Strickland rushes downfield against Florida State. Mandatory Photo Credit: Initra Marilyn, The Juice Online. Item: One of the nuggets we missed with last week’s announcement of the composite 2019 ACC football schedule is that Wake Forest, Syracuse’s current Atlantic Division-mate and regular season finale opponent in the Dome Nov. 30, is going to host Coastal member North Carolina (originally announced in Jan. 2015) in a NON-LEAGUE matchup Sept. 12, creating the first time that Wake has played and hosted the other three “Big Four” conference schools located approximately 60-90 minutes from its campus (Duke and N.C. State) in the same season since 1921. It got us thinking when taking a look at the Orange’s future schedules. If the ACC won’t change its conference alignment stance but will allow conference teams to compete against each other in games that don’t count in the league standings, then SU should follow Wake Forest’s lead and schedule the Hurricanes and Hokies, teams Orange Nation wants to see play in the Dome, instead of, let’s say, a Big Ten school such as Purdue in the 2022 season that doesn’t carry the same cache. The only two things we remember about Syracuse and Purdue matching up in football is Paul Pasqualoni unfairly decided to start overmatched true freshman Joe Fields at quarterback against the Boilermakers in the 2004 season opener in West Lafayette, Ind., and the final score was 51-0 in favor of the home team, the beginning of the end of the 14 year Coach P run. An inter-sectional Big Ten game simply does not match the same kind of hype and superlatives we can all relate to when compared to the Miami and Virginia Tech meetings over the last 30 years. As we know, going into its seventh ACC football season this Sept., SU has only played Miami and Virginia Tech once apiece, making it hard to relate that the teams actually compete for the same title trophy awarded in Charlotte the first Saturday of each December, and denies the Orange regularly scheduled trips to the fertile south Florida recruiting territory. As part of the original ACC crossover rotation, SU will play at Virginia Tech in 2021, and Miami finally makes its ACC Dome debut in 2024, the current final season of the original 12 year home and away sequence between the Atlantic and Coastal division teams. The Orange also has non-conference games scheduled against Power 5 teams Rutgers in 2020-21, Notre Dame in 2022, and the aforementioned Purdue series in 2022-23, so games can’t be squeezed into those seasons. Since Wake Forest and North Carolina will play in 2019 at Winston-Salem, 2021 at Chapel Hill to complete the non-conference series, then again in 2022 at Winston-Salem as part of the current crossover rotation, perhaps the Orange could commence a home-and-home, non-conference series with Miami in 2026 and 2027, and Va. Tech in 2031, the earliest it appears the Hokies have a vacancy for a Power 5 non-league game. Then again, by the time the current rotation schedule is set to conclude in 2024, the ACC will have had four plus years of running the linear ACC Network that debuts in August to contemplate adding programming with a ninth conference football game. That decision, or perhaps an eventual reconfiguration with just one division of 14 football teams, would simply make adding a conference mate as a non-league game a moot point.